The THRILL Multi-FX LED is a terrific value for money combining three energizing effects into one fixture. This is truly a Swiss army knife of lighting extravaganza. 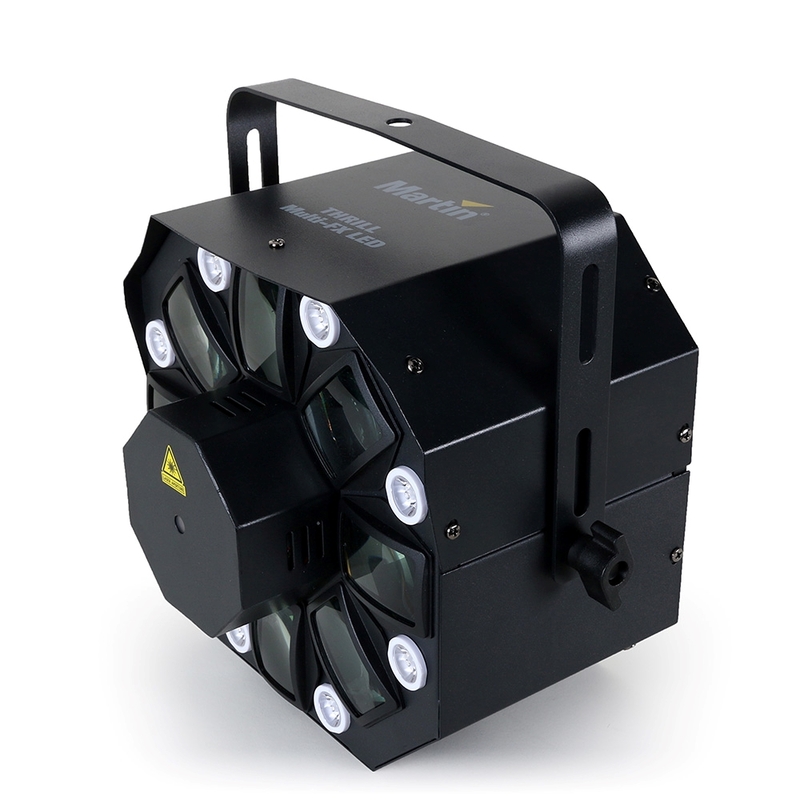 Perfect for performers who want to outfit their show with high intensity, stunning lighting effects, but have limited space for mounting and transporting equipment. 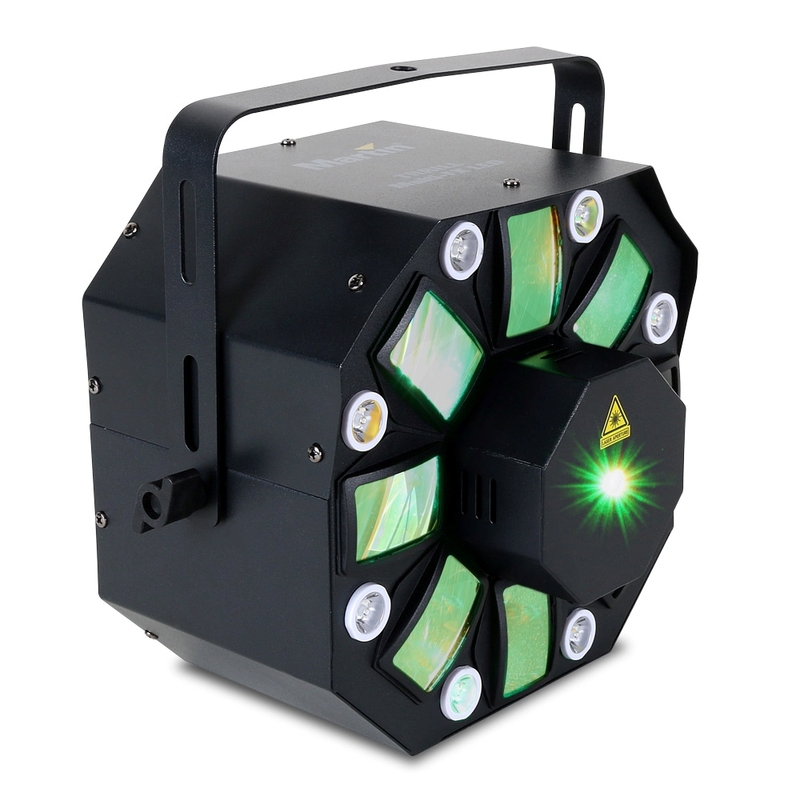 The THRILL Multi-FX LED has an impressive laser effect engine consisting of independently controlled red and green lasers. Hundreds of laser beams project simultaneously, washing over the crowd, exciting the eye. 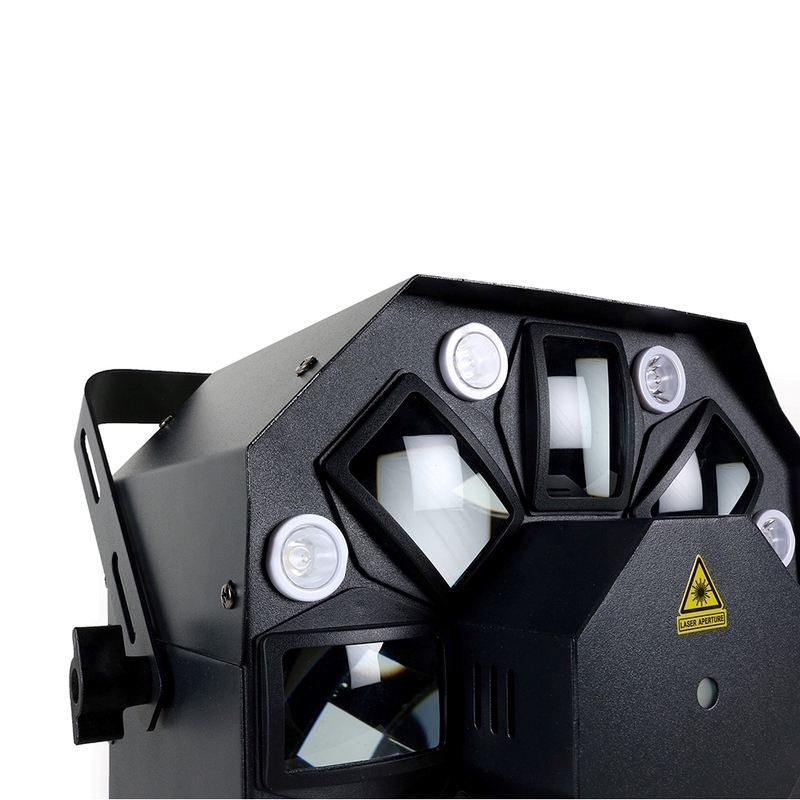 The lasers have pre-defined shapes, patterns and movements which can be easily customized to suit your entertainment style. The THRILL Multi-FX LED is easy to control whether used as a standalone fixture or as part of a complete DMX control system. 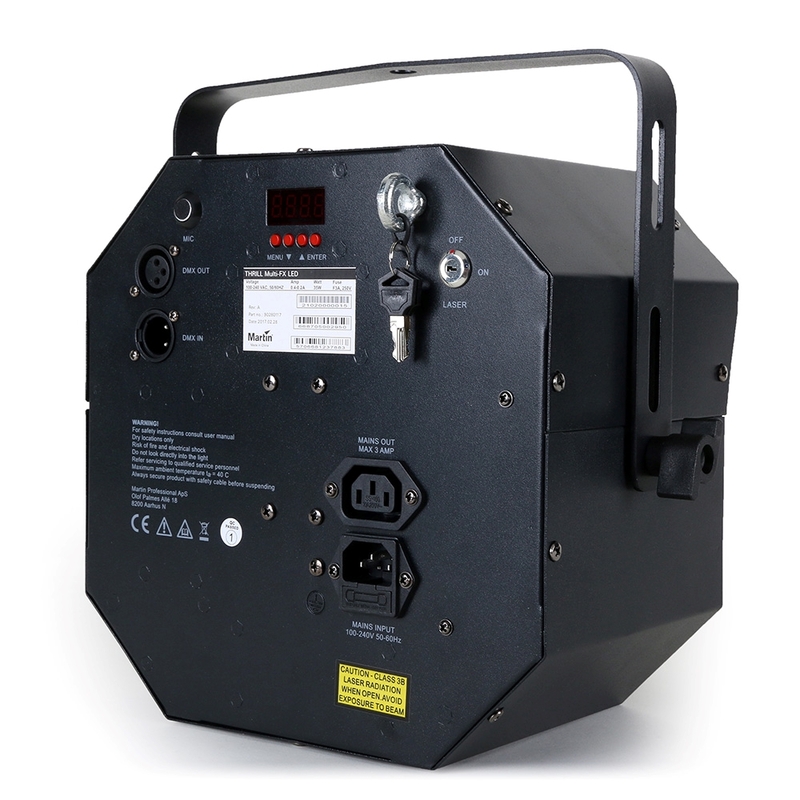 The THRILL Multi-FX LED can be easily manipulated via any standard DMX controller. In addition, you can daisy chain up to 32 fixtures in a master/slave configuration. Want to customize your live set and take things further than the 8 preset shows? No problem. The THRILL Multi-FX LED features several macros on each channel that you can use as a baseline in your programming. And when you need a break from controlling the lighting, easily put the fixture into the Integrated Show Control Mode via DMX, and let pre-programmed looks and a sound trigger do the work for you. ElectricalAC power: 100-240 V nominal, 50/60 HzFuse: F 3 AL, 250 VTypical power consumption:: 35 W*Maximum number of fixtures on AC power throughput, 100-130 V: 6 x THRILL Multi-FX LED or 3 AMaximum number of fixtures on AC power throughput, 220-240 V: 10 x THRILL Multi-FX LED or 3 A*Power consumption figures are typical, not maximum. Allow for +/-10% variation. ThermalCooling: PassiveMaximum ambient temperature (Ta max. ): 40° C (104° F)Minimum ambient temperature (Ta min. ): 0° C (32° F)Total heat dissipation (calculated, +/- 10%) at full intensity, full white: 225 BTU/hr.